Ronnie, a married man of five and a half years, will miss his wife tremendously while he is in the BIG BROTHER house because she puts up with him, and he worries that his Housemates may not. He describes his wife as his hero and says she is one of the kindest people he has ever met who embraces everyone in the world. He is obsessed with video games and often plays more than six hours a day, even to the point of ignoring his wife. Ronnie is a collector of all things sci-fi, especially Star Wars collectibles. Ronnie is an über BIG BROTHER fan who can recite the order of every person ever evicted from the BIG BROTHER house. This student is most proud of being a national champion in speech and debate, as he feels this activity is where he excels. One of the most interesting things he learned from one of his previous jobs as a travel agent is that you can purchase a personal blessing from the Pope. Ronnie's birth date is January 15, 1979. I fear he will win. He seems way to smart. . . I'm excited to have an "uber" fan in the house. I always get annoyed when HGs know absolutly nothing about the show. If you are going to audition for something - have a plan! I do believe this guy knows his stuff from reading his bio. We shall see. this guy reminds me of someone that was on Beauty and the geek.. i have to research this.. it's gonna bother me! ok he wasn't part of the cast.. but he looks familiar!! LOL wow i wonder what he's got hiding up his sleeve!! I'll wait to see him in action .. not a fan at the moment. AMEN! Know the game and just don't try to pass by with your muscles or a bikini...I like Ronnie based on his bio and I hope he can go far. VIENNA - A Vienna man will be a "house guest" on a CBS reality show which begins airing July 9. 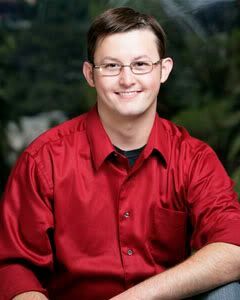 Ronnie Talbott will be part of the 11th season of "Big Brother," a reality show where a group of people live together in the Big Brother House, isolated from the outside world, but constantly watched by television cameras. On the show the object is to win a cash prize by avoiding periodic evictions. Talbott, 30, is a 1997 graduate of Parkersburg High School and an education major at Ohio University. His mother, Charlene Talbott, said he left for Los Angeles several days ago and will not be able to contact family members until after the show is over in September or sooner if he is evicted from the house. "They are not allowed to have any electronic devices to communicate with the outside world," she said. "They can't even have a pen or pencil and paper." Talbott said he has been trying to get on the show for the past six years. "He is an avid fan of 'Big Brother,'" she said "He is the first person from West Virginia to be on the show." Talbott said her son had to go through two interviews in Ohio and spent several days in Los Angeles for interviews to be selected. "He was interviewed twice in Columbus," she said. "He was one of 17,000 they interviewed out of millions who applied." Michelle Dye Talbott is his wife. She said when she learned he would be on the show, she was happy he was able to do something he wanted to do for a long time. "I was excited for him; it was something he wanted to do for a number of years," she said. "He was very excited. I'm very excited. This was the fourth time in six years he tried to get on the show." In pursuit of that dream she said they drove to Memphis, Columbus and Cleveland for auditions. Charlene said Ronnie will use his debating skills and intelligence on the show. "In school he was a speech and debate champion in the National Forensic League," she said. "They tested his IQ for 'Big Brother' and it was 132. "He told me he was going to use his skills and intelligence to win." Ronnie will also appear in a Biography Channel presentation in July, she said. Michelle said although she will see him on television and an Internet feed, it won't be the same as having him around and it may be the end of September before his family will see him again in person. "It has not sunk in yet, really; it's been rough already," she said. "I cried when he left. I'm already missing him. He's a person who brings so much color to the world." She said her family was excited when they heard the news about him. "My parents were watching the CBS News Early Show when the cast was announced; they are also excited," she said. "My sister Melissa posted on her Facebook that her big brother is on 'Big Brother' right after the announcement. She was very excited." While Talbott is the first resident of the Mid-Ohio Valley to be on "Big Brother," he will not be the first person with ties to the area to appear on a reality show. In 2007, Aaron Reisberger was a contestant on "Survivor:China," which also aired on CBS. Reisberger has family in Washington County. In many ways, Ronnie Talbott’s life has come together through his speaking abilities. Not only has he met his wife, Michelle, through forensics, but he has also had a memorable career thanks to his communication abilities and acting skills. Involved with forensics since 1994, Ronnie has returned to the sport as a competitor once again. As an education major, returning to Ohio University has allowed him another opportunity to showcase his speaking skills. “My favorite thing about Ohio University is the chance to compete in forensics again,” he admits. In addition to being a competition participant, Ronnie is also a coach. He is assistant coach to Michelle’s Advanced Communication/Forensics classes at Parkersburg South High School. The West Virginia native boasts a colorful career in theater as a professional actor. Ronnie worked on the films Burning Annie, Maneater, and Spiderman 3 in addition to starring in a CMT music video for Carolyn Richards. He has been selected for the Hangar Theatre in Ithaca, N. Y., and is a member of The Parkersburg Actor’s Guild. Wow nice find Blondie, on the Solitary 3.0 audition tape! That gives alot of insight on Ronnie. Best quote, "I'm a geek, it's chic, I don't give a crap, i'm bringin' it back!" Hummm... very interesting to think of him on BB though. I watch Solitary too, he might have done well on that show. OMG I wish he woulda been chosen for Solitary!! he wouldn't have lasted!! sorry folks i hope he does himself in!! that video was dreadful! To all of our posters, please don't think that you cannot post what you feel about a houseguest. We all have our favs and we all have that one that we just cannot stand. No need to be sorry. We love each and every one of our posters. The different views are what makes RFF the best BB forum. Just as a reminder: You may bash a houseguest all you want, but bashing a poster for their opinions is abig We want you ALL to be able to feel free and not be afraid to say what you want ABOUT THE HOUSE. For all of our new members, and enjoy! Yes, BB HG bashing is okay but not RFF posters. We all need to get along but I can't wait to see how Ronnie is edited on the show. After watching the first show, Ronnie needs to take a chill pill. I know he's excited to be on the show but he doesn't have to be over the top! Yea, I know what you mean. In fact, he sounded a little gay. He has that stereotypical kind of gay sound to him and he was sayin "oh my god" and was a little too excited but he doesn't seem to be. He seems pretty smart and I think the housemates will underestimate him and probably keep him as they don't see him as a strong physical threat. I agree on lacking a physical threat and being "floated" along until someone kicks him off near the end. He's an interesting HG and I guess I will have to see a few more shows before I can say who I think will make the FINAL FOUR. I'm looking forward to tonight's show! He reminds me of Napoleon Dynamite's brother in a way. Big Brother 11: Meet Ronnie!